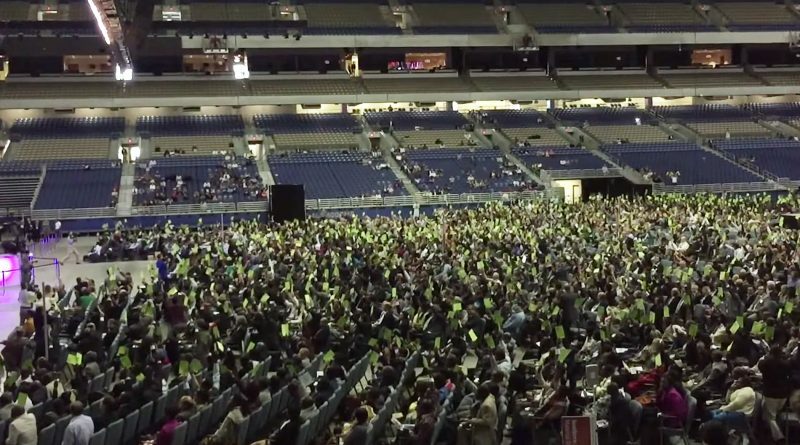 Delegates to the General Conference Session are enjoined with the task of choosing the world-church president for the next five years, a duty many of them believe is a solemn responsibility that requires much prayer and wisdom. On July 2, the first day of the General Conference Session 2015, each division met privately to choose nominating committee members. Then division representatives selected a name for presidency to submit to the General Conference full business session, which met the next day. At 10:45 a.m. on July 3 Chairman of the Assembly Pardon Mwansa welcomed Nominating Committee Chairman Homer Trecartin and Secretary Leslie Pollard to give their report to over 2,000 delegates. Immediately after the second, Raymond Hartwell of the North American Division (NAD) appeared at a microphone to speak. Hartwell briefly stated his respect for the church, the leaders, and the process and immediately requested that the report of Wilson’s name be referred back to the committee. Mwansa questioned if Hartwell’s objection to the nominee warranted return of the report to the committee. “In most cases the nominating committee looks and examines quite a lot before they bring a report,” Mwansa said, who also questioned that the objection was of a substantial nature. Hartwell responded by citing General Conference Rules of Order, which says that usually a chair accepts a request for a referral. Mwansa responded to this point of order, showing that he was within the rules of order as the chairman. Hartwell went to the side of the room to meet with the officers of the nominating committee to share his concerns while the delegation waited and the appropriate hymns, “Lead On O King Eternal,” “Great Is Thy Faithfulness,” and “He Leadeth Me” were played. The statement was greeted by more applause. Mwansa attempted to proceed, but was stopped by a point of order requesting a secret ballot. However, it was pointed out that the request was not a true point of order. A question on the motion was then requested by NAD delegate Neil Nedley, but was not allowed. NAD delegate Sadrail Saint-Ulysse took the floor and requested to speak to the nominating committee. After Saint-Ulysse insisted again, Mwansa consented and the delegate went to share his concerns about the nominee with the nominating committee officers. Just five minutes later, Saint-Ulysse returned and the nominating committee officers reported back again. Again, loud applause from the delegates. There were two more points of order brought by delegates, which failed. Elizabeth Talbot, an NAD delegate, eventually moved to have a secret ballot, “due to the magnitude of this decision,” whose motion was seconded. Mwansa returned to the motion. Very few raised their colored cards. “Those opposed by the same,” said Mwansa. Many cards were raised, showing the delegates were not interested in a secret ballot. Larry Boggess, NAD delegate, said delegates used to pray in situations like this and then said he would like to call a question on the previous question. Mwansa then called for a vote on the motion to cease discussion, which passed. The delegation was ready to move on to the main motion. Mwansa called for a vote. The air filled with cards above an overwhelming majority of delegates. “Thank you. Those opposed by the same,” said Mwansa. A localized smattering went up with the same sign. The motion was carried by a landslide.